Rajesh Nair’s premier knocked an unbeaten 140 to help his side chase down Strikers . Premier has only managed one win this season for the record against the slayers strikers. Strikers was able to post 317 thanks largely to Rogers Olipa (61) and Derrick Bakunzi (63) who dug them out of a pit at 90/6. The pair had a partnership of more than 100 runs and a late cameo from Richard Agamire (27) took the score past the 300 mark. With the quality of bowlers in the Strikers attack, Premier needed something special to overhaul the total. Rajesh Nair seized the moment by taking on the Strikers attack with an array of beautiful shots. His 360 knock was supported by his captain Ratesh Nair (30) who was with him till the end. This was Premier’s first win of the season and Strikers will have to take the loss as a chance missed to gained some upward movement in a table that is becoming very tight. Aziz Damani the defending champions are closing in on their second title in a row after seeing off KICC at the lakeside oval in Entebbe. Riazat Shah the national team all rounder(100) was the hero for Damani scoring a big century with support from Saud Islam (56). 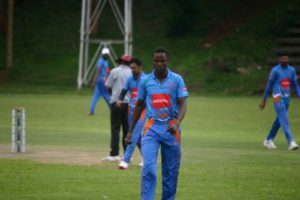 KICC hustled to overhaul the richly assembled Damani side but national team opening bowler Bilal Hassan (5/35) had other ideas picking a fiver giving the defending champions an 86 run win. Meanwhile, Challengers ended Ceylon Lions winning streak with a 32 run victory at the Kyambago Grounds. Aneef Sha (100) scored his first century in local cricket with forgotten man Arthur Kyobe (70) backing him up with a half century. Simon Ssesazi (51) continued his impressive display with the bat for Ceylon Lions but his half century was not enough to drag his side over the line as they were all out with 32 runs required.